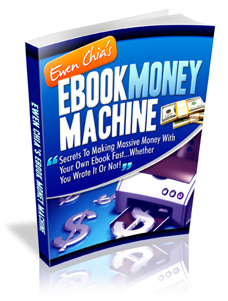 Ewen Chia´s Ebook Money Machine! The easy way to write your own ebook. No, it's not hard...and you usually don't have to start from scratch. I'll hand you 13 easy ways to create a product that'll make your market (and other marketers) drool. And 12 of those methods are NOT starting from scratchsome are so easy you might think they're criminal.